"Fahey, Sheffer, and Beals together! How can it miss?! And Gene Hackman isn't bad either." Ah, 1988. It was a very good year. I'm a child of the 80's. I started high school in 1988. And I spent a good portion of my formative years doing what most kids did in the 80's... hanging out, going to parties, trying to sneak into R rated movies, playing with our Rubik's Cubes, our "Jams" and "OP" shirts worn just so. I look back on that time fondly. But I have to say, I have absolutely no memory of this movie. And I was a pretty astute movie buff, even back then. So when I saw this coming on cable this month, I had a certain amount of excitement tempered with trepidation; here was a movie from a great time in my life, but if it was actually any good, why hadn't I heard of it? I got my answer soon enough. 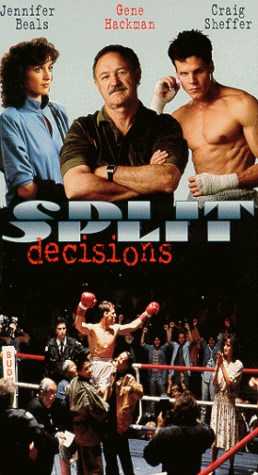 "Split Decisions" is the story of the McGuinn family, an exceedingly Irish-American brood living in NYC that consists of father Dan (Hackman), Pop (John McLiam), youngest son Eddie (Sheffer), and estranged older boy Ray (Fahey). The McGuinn's run a boxing gym where they train Golden Gloves fighters. Eddie is a 4 time Golden Gloves champ who has Olympic aspirations and plans to go to college someday. Dad and Pop are proud as punch of Eddie, as is the whole community it seems. They're all pulling for him. It's just darn nifty. Of course, then we find out that part of Dad McGuinn's emotional investment in Eddie's future is due to the fact that his older son, Ray, didn't go the whole "Olympics/college" route but instead turned pro. And not only that, but he went to a rival gym to be trained, being that his father refused to support his pro career. It's to the point where Dan won't even watch his son fight on TV. So here we are. The stage is set for a family drama, and to this point, a fairly engaging one. Ray is coming home to Hell's Kitchen to promote a fight against promising local up-and-comer Julian "The Snake" Pedroza (why not just name him Julian "The Bad Guy" Pedroza?). There's still no reconciliation between Dan and Ray, despite the wishes of both Pop and Eddie. Eddie idolizes his older brother and follows him around his promotional gig (which is apparently being held at an upscale pizzeria. Ooh, swanky! They've got garlic bread and everything! I hope they had enough press passes for this blockbuster match-up!). After a photo op, some Q&A, and some smack-talking with Pedroza, Ray is informed by his manager that the mob-connected promoter (played be the eternally bald James Tolkan) wants him to take a dive against Pedroza, or else he'll never get a title shot. And this was what I felt was the first MAJOR misstep of the movie. THEY'RE ALREADY PROMOTING THE FIGHT! Personally, I think the promoter is taking a big chance asking one of the participants to throw the fight this late in the game. If the fix was in, I'd find my patsy FIRST, and then start promoting this thing. Why spend all of this money (especially the press conference at the pizzeria!) if there's a chance that the guy might not agree to go along with the dive? Which, of course, is what happens. Ray struggles with the decision for a few scenes (and these scenes with Fahey and Scheffer interacting are the best in the movie by the way), but ultimately he ends up turning the fight down. So the mob-ish promoter (with the Uber-evil Pedroza in tow) beats the crap out of Ray and ends up killing him. WHOA!!! WHOA!!! THIS WAS PLAN "B"?!! If Ray doesn't go along with the fix, kill him?! Seems a little severe, no?! Anyway, once Ray is dead, the family drama goes out the window for the most part. So does the rest of the movie for that matter. We're treated to an according to formula sports/action plot from here on in. Eddie abandons all plans for the Olympics and college to turn pro and avenge his brother's death by fighting Pedroza. Dan is of course against it, but you know he'll end up supporting Eddie in the end, don't ya? And once Dad is behind Eddie, we're only a training montage away from the "Big Fight" finale. Not only is it well worn territory, but it's done exceedingly bad (I'll get to that later...). So where did it all go wrong? I can't really fault the actors. They did the best with what they had. Hackman is always dependable, but he doesn't have much more to do besides some yelling here and there (although, this is honestly the only movie I can think of where he has a crying scene.. does anyone else remember a weeping Gene?). The heavy lifting was done by Scheffer and Fahey (2 more products of the 80's, gone the way of Wang Chung for the most part). I don't know why these two guys have been relegated to Direct-to-Video fare in recent times. They handle the dramatic stuff with touching realism and the movie is at it's best when they're playing off each other. But Fahey gets rubbed out halfway through and the story flounders for the remainder. Is that everybody? Let's take a look at that movie poster, anyone else get top billing? Oh yeah! Jennifer Beals! This is 'post-Flashdance' Jennifer Beals, and she seemed to be searching for an identity at the time. Thankfully she settled on "Very Attractive Woman" for future projects, because in 'Split Decisions' she's given one of the most forgettable roles of her career, and, possibly, movie history. It's not that she's bad.. she's barely even in the movie! She has maybe a dozen lines and has absolutely no impact on the story. Maybe a lot of her stuff ended up on the cutting room floor, I don't know. Regardless, you can't blame this one on her. What we have here is a more than adequate cast, but a script that doesn't quite measure up. The fighting has 2 VERY distinct levels of quality. In the first half of the movie we see some very believable amateur training and fighting. I wouldn't be surprised if we were watching some real adolescent Golden Gloves action in some scenes. And even Ray's televised fight looks believable enough, despite some of the oddest looking facial trauma I've ever seen. Let me explain. It looks to me like the filmmakers and special effects people wanted to give the look of scar tissue around both Ray and Eddie's eyes. It's a tough look to pull off, even for an adept SFX crew. They didn't go the latex route here though; instead they shaved "dents" into the actors eyebrows. You read that right... dents. Sufficed to say, it doesn't look like scars. It looks like Ray and Eddie have some sort of genetic form of the mange that causes their eyebrows to shed. Or maybe they're really big but not very dexterous Vanilla Ice fans. They both look more than a little goofy. The big problems show up later though, in the beyond-hackneyed training montage and the "Big Fight" finale. Simply put, we watch a rotation of the same 3 training scenes: Eddie jogging, Eddie sparring, Eddie getting yelled at by Dad, repeat. Eddie does change his outfit for the jogging rotation at least. I don't even remember there being an "Eye Of The Tiger" musical rip-off during the training scenes. Come on guys! That's just basic! And then it's fight time! Sigh... it's not good. I'll try to explain this as best I can. The fight scene lasts the final 15 minutes of the movie. The fight goes into the 8th round I believe. 3 minutes a round with a one minute rest in between each round. If I'm doing my arithmetic correctly, that would be 31 minutes for the full 8 rounds. So, with some creative editing (hell, even not so creative editing) you can show the passage of 30+ minutes in a 15 minute span. It's expected! Who wants to watch 30 minutes of fake boxing?! So what do they do here? They show it in real time! They would have us watch 1 minute of boxing, bell, show the ring girl with the Round 2 card, 1 minute of Gene Hackman yelling at Craig Sheffer in the corner. 1 minute of boxing, bell, show the ring girl with Round 3 card, Gene berating Craig. Repeat that 5 more times and you have the "Big Fight" finale! I swear! Tedious? It's beyond tedious! It's ridiculous! The big problem for 'Split Decisions' (goofy eyebrows aside..) is that we have a mixing of genres here. We start with a taut and promising family drama. But the script just shifts into a sports-oriented action movie about halfway through and the cliches are piled on. It's unoriginal and it doesn't play to the casts strengths. Sure, Gene Hackman was inspiring in "Hoosiers", but I don't think you can go to that well again. They should have just stuck with the tensions inside the McGuinn clan. It would have been a lot more interesting than the "I must avenge my brother!" plot convention. And I'll bet you never thought you'd hear the phrase, "Once Jeff Fahey's gone, the picture just falls apart." Well, there you go.